First Edition ISBN 978-0-9738679-5-4 currently selling. 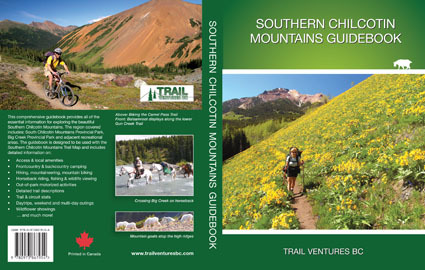 © Copyright 2015 by Trail Ventures BC Inc.
Third Edition ISBN 978-0-9738679-8-5 currently selling. This is the 3rd edition of the GPS-based trail map of the Southern Chilcotin Mountains area including access roads, tracks, trails and mountaineering routes. Scale 1:62,500. The 3rd edition of this map is now 2-sided with a 1:30,000 map of the core area added to the backside. Roads and trails are qualified for best access info and trail finding. All roads, tracks, trails and mountaineering routes were mapped from 2002-2016. Includes the South Chilcotin Mountains Provincial Park, Big Creek Provincial Park and the Mud Lakes Area. For hiking, mountaineering, mountain biking, horseback riding & backcountry skiing activities. Accurate positions of campgrounds, campsites and cabins. Locations of all major creek crossings given. 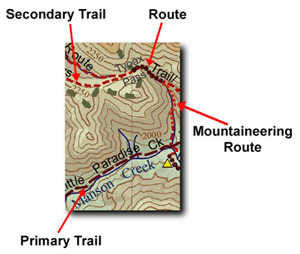 UTM positions of all major trailheads given. Locator map with access info provided. UTM and lat/long grids. 1:30,000 scale inset map of the Spruce Lake Area. Waterproof and tearproof. Redesigned for use with the Southern Chilcotin Mountains Guidebook. Updated access road and trail ratings. New trails added. Updated park and Mining Tourism Area (MTA) boundaries. Double-sided map: New 1:30,000 map of core area added on backside. New landmark features added. Also, new annotation (text) for geographical features has been added which matches that of the guidebook. Trails include: High Trail, Gun Creek Trail, Greasy Hill Trail, Open Heart Trail, WD Trail, Tyaughton Creek Trail, Taylor Creek Trail, North Cinnabar Creek Trail, Relay Creek Trail, Big Creek Trail, Tosh Creek Trail, Grant Creek Trail, Lorna Lake Trail, Lizard Creek Trail, Deer Pass Trail, Warner Creek Trail, Slim Creek Trail, Leckie Creek Trail, Gun Lake Trail, Lone Valley Creek Trail (Prentice Lake Trail), Paradise Creek Trail, Little Paradise Creek Trail, Graveyard Creek Trail, Powell Creek Trail, Lick Creek Trail, B&F Creek Trail, Pearson-Taylor Trail, Eldorado Ridge Trail, Lower Grasslands Trail, Mid-Grasslands Trail, Upper Grasslands Trail, Windy Pass, Elbow Pass, Deer Pass, Taylor Pass, Warner Pass, Iron Pass, Castle Pass, Powell Pass, Wolverine Pass, Jewel Creek Trailhead, Jewel Bridge. Attention to detail: Roads are rated according to road conditions: paved, 2WD, 2WD High clearance, and 4WD. 2WD High clearance vehicles are recommended. Likewise, trails and routes are rated to help guide users through the map area: track, primary trail, secondary trail, route and mountaineering route. 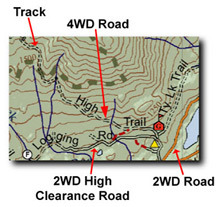 This detail will be of particular use in this area where trail conditions can vary considerably over short distances. 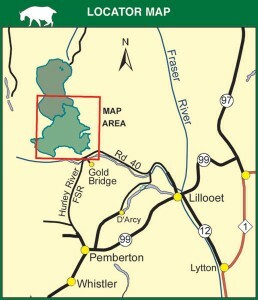 In addition, small side creeks and trailside pond positions, not indicated on any other maps, are shown. This is because Trail Ventures BC is the first map maker to map these trails and routes on foot – most of them several times. Grids: UTM (Zone 10U) and lat/long. Map projection/datum: NAD83. UTM gridlines plus gradations on the outside of map frame; and lat/long gradations on inside of map frame. © Copyright 2016 by Trail Ventures BC Inc.